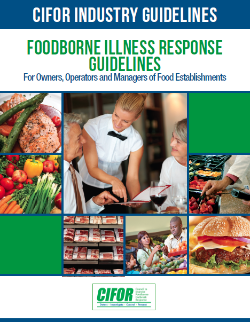 The CIFOR Foodborne Illness Response Guidelines for Owners, Operators and Managers of Food Establishments (Industry Guidelines) are voluntary recommendations for owners, operators, and managers of restaurants and other retail food establishments (“Industry”) to clarify Industry’s role in a foodborne illness outbreak investigation. The Industry Guidelines and its tools help Industry take an active and educated role in outbreak response, thereby reducing negative economic impact to their businesses. This product was developed by the CIFOR Industry Workgroup, a public/private partnership of experts from government and the food industry. The Industry Guidelines are not intended to replace company guidelines or local, state, or federal regulations or procedures. Instead, the Industry Guidelines are a reference document to create Industry procedures where none may exist, complement existing procedures to fill gaps and update establishment-specific procedures, and to develop specific training for staff. Who should use it: Owners, operators and managers of restaurants in a foodborne illness outbreak investigation. It is also helpful for government investigators of foodborne illness outbreaks involving smaller food businesses. Tool 7D - Poster: Do I Feel Well Today? Tool 7F - Poster: Would You Want These People In Your Kitchen?